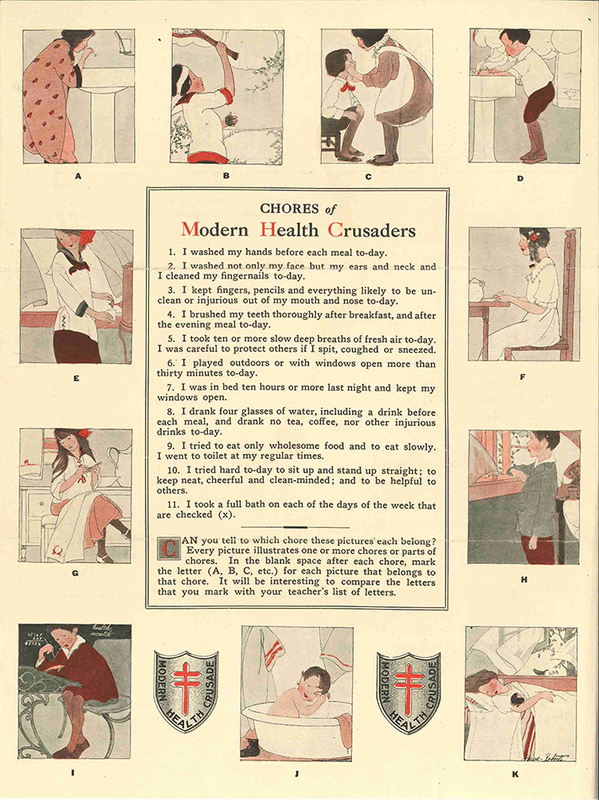 Poster depicting the eleven Chores of Modern Health Crusaders. These eleven health chores set out the essentials of tuberculosis prevention and general hygiene. They were part of a public health campaign devised by Charles De Forest of the National Tuberculosis Association. 1. I washed my hands before each meal to-day. 2. I washed ot only my face but my ears and neck and I cleaned my fingernails to-day. 3. I kept fingers, pencils and everything likely to be unclean or injurious out of my mouth and nose to-today. 4. I brushed my teeth thoroughly after breakfast, and after the evening mean to-day. 5. I took ten or more slow deep breaths of fresh air today. I was careful to protect others if I spit, coughed or sneezed. 6. I played outdoors or with windows open more than thirty minutes to-day. 7. I was in bed ten hours or more last night and kept my windows open. 8. I drank four glasses of water, including a drink before each meal, and drank no tea, coffee, nor other injurious drinks to-day. 9. I tried to eat only wholesome food and to eat slowly. I went to toilet at my regular times. 10. I tried hard to-day to sit up and stand up straight; to keep neat, cheerful and clean-minded; and to be helpful to others. 11. I took a full bath on each of the days of the week that are checked (x). “Chores of Modern Health Crusaders,” Social Welfare History Image Portal, accessed April 26, 2019, https://images.socialwelfare.library.vcu.edu/items/show/194.